Adam Lambert is busy promoting Ghost Town, the first single from his upcoming third album, The Original High. 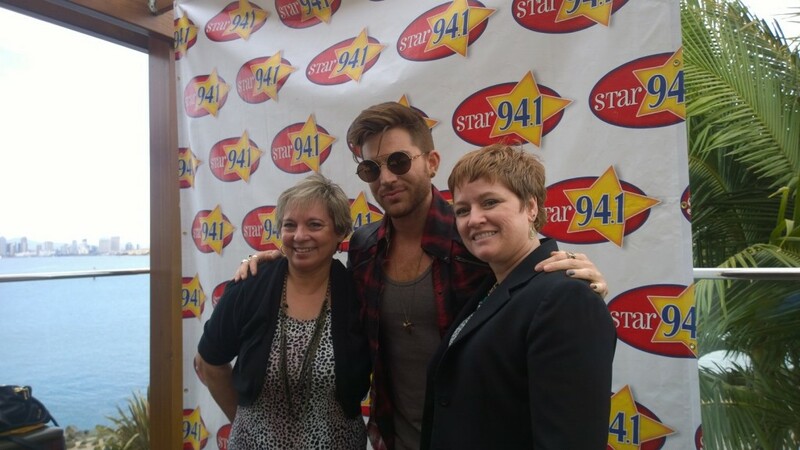 He made a visit to hometown San Diego, including two radio stations and made some very lucky fans extremely happy. And Lila and I were two of them! I won 2 tickets for the exclusive Happy Hour from San Diego’s Star 94.1. I thought for sure it would be on Friday, May 8th, Adam Lambert Day but it was May 5th instead. The station eventually released the date online but we were sworn to secrecy about the location. 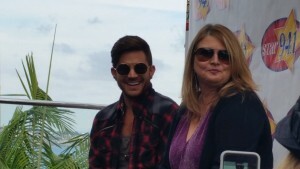 On-air, they said they were keeping the location secret because they know the Glamberts! They said the last time Adam was here (March 30, 2012, promoting Trespassing) and they had a contest, even non-winning Glamberts filled the parking lots and the DJs had no room to park. Yes, Lila and I were part of that non-winner group! They didn’t even tell the winners the location until 4 hours prior to the event. And again, I was cautioned to keep it a secret, so that’s why I didn’t write about it ahead of time. I knew people would ask, and I would hate to say no, so I took myself out of that situation by keeping mum. Almost as good as Adam keeping mum for 1 ½ years about his new label deal! The event was at Bali Hai, a restaurant overlooking the water on Shelter Island, very close to the airport. This was good planning because as soon as it was over, the Warner Bros personnel whisked Adam away, saying he had a flight to San Francisco to catch, for even more promotion the next day. It’s so nice to see how actively Warner Bros is supporting Adam and his new music! Right Glamberts? You’ll hear about this in the video. So let me share with you how our Happy Hour went, and please forgive me for fangirling through this! I want to write this so you can feel like you were there. Winners were chosen on Friday, May 1. Listeners were asked to call the station starting at 7:50 AM, and every hour after on the: 50, ending with 4:50 PM. I woke up that morning, determined to win. Fortunately it was a non-work day for me. I got very lucky and scored on the 11:50 AM call-in, even getting through a few times on earlier hours, but being the wrong caller. Fortunately the call only lasted about 5 minutes, because I had a 12 PM date with the computer, trying to get tickets for a Muse event, but that’s another story! There were only 10 winners, and each could bring a guest. The morning of the Happy Hour, they gave away one more ticket, which went to a super fan from Temecula, about 60 miles away. With only 11 winners, each with a +1, this was going to be an intimate event! Of course Lila went with me. Aside from being best friends and a loyal Glambert, Lila also won a contest recently for an AWOLNATION concert at the KROQ Red Bull Stage in Los Angeles and brought me. They’re one of our favorite bands. Another magical, small audience event and still another story! So me bringing Lila was KARMA baby! The Happy Hour was from 5-6 PM and we were asked to arrive 30 minutes prior for check in. We got there early, just in case of traffic. Lila and I were the first ones to arrive, no surprise there. We went upstairs to the outside patio and chatted with Hayes and Chris from Star 94.1. They told us this would only be for 30 people. The patio was small, with two 4-seater tables, four 2-seater tables, four tall 2-people tables, and a station backdrop, perfect for pictures. Lila and I took a 4-top, both sitting on the same side, looking right at the backdrop, figuring that’s where Adam would spend most of his time. They told us he was going to be coming around, from table to table, spending time with each of us. Woo-hoo! We were going on a speed-date with Adam Lambert!! The patio filled up, but only with about 25 people, and believe it or not, the majority didn’t look like Glamberts. Two full-on fan girls asked to sit with us and we now have Robin and Jamie at our table. Robin was the girl who won from Temecula earlier that morning. They were really bubbly and excited. Turns out, Jamie had also won tickets for her and Robin to a morning promotion event from JACK FM, another San Diego station. How lucky can you be?! Food was brought out to the tables from Bali Hai. We munched on Wasabi Fries, Spring Rolls, something fishy that I can’t remember, and fried shrimp. Lila and I ordered tame drinks, deciding to forego alcohol – we were giddy enough! 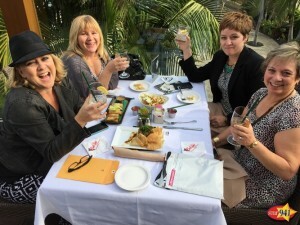 Robin, Jamie, Lila and Carol toast the event and enjoy Happy Hour munchies! 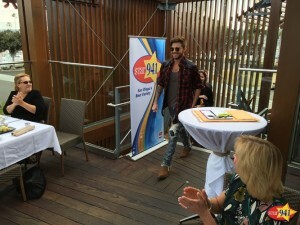 A little after 5 PM, running on classic Lambert time, Adam comes up the stairs onto the patio. We cheer and we’re greeted with huge smiles from him. He takes a seat at the Star 94.1 backdrop with Delana Bennett, one of Star’s DJs. They immediately start talking about Adam being back home in San Diego and he tells us he came down the night before, going out to eat with friends, and how he had such a good time. They begin talking about Ghost Town, The Original High, working with Max Martin, and then opened it up for questions. Enjoy this 14-minute video that begins shortly after they started talking, shot from our table by @robinsmith66. I’ve been waiting for it so I could really share the event with you, and she just sent it over to me! At 5:45, you’ll hear me asking a question about what influences Brian & Roger may have been, personally and with songwriting. He answered, keeping his focus on me the whole time, and giving me MY most original high! At 8:14, I added the Shazam to the conversation and Adam encouraged us “Glamberts, spread the word! Shazam the heck out of the song. It’s great, it helps a lot.” I then mention the caution we’ve received about only Shazaming it once a day, and he’s surprised how much we all know! Now sit back and enjoy Happy Hour With Adam Lambert! I have a lot more to share, including a special message from Adam directly to you, the readers of our site! You’re not going to believe what he told us! But this post has gone longer than I thought it would and I don’t want to wear you out. After waiting so long, there’s only so much we can take – ha ha ha! Thanks Carol for sharing this with us. You and Lila are the best. And to think I was excited because my niece gave me an Adam Lambert calendar last week and just thinking how excited you two were to be there. So happy for the two of you. Once again thanks for sharing. What an AWESOME day for you two!!! I’m living vicariously here right now and can only imagine what it must have been like spending that time chatting with Adam. Thanks for sharing a little bit of your experience.. DYING to hear the rest!!!! Hugs to both of you!!!! Thanks soo much for sharing this. Being able to chat with Adam in such an intimate setting is something I can only dream about, although I have been able to get to 3 M&G’s. But each of these were very rushed events and I just can’t imagine what it would be like to spend time with him. Very glad for you. I’m a Canadian Glambert (since Satisfaction) and hope Adam makes his way up here on his promotional trips. I just LOVE Ghost Town and am so excited for him. Honestly, it’s great that you won this but your tablemate Robin should be so embarrassed with her behavior at this event. Telling Adam, in front of a POP RADIO DJ that he’s not a pop singer is RIDICULOUS. Adam IS a pop singer because that is what he chooses to be. and then to basically insinuate that Max Martin makes crap music? are you kidding me with that? I mean come on. It was bad enough that ladies of a certain age clustered into this happy hour event but then to basically insult the most successful music producer in the genre and to insult the genre itself is just inexcusable. Also, to mention that we’ve been “instructed” to Shazam once a day? wow. really? it doesn’t occur to you not to say that in front of a DJ? Adam is a better person than I would be that’s for sure. I don’t know why some of the Glamberts can’t get that as much as they love Adam they are hurting him with their OTT obnoxious behavior. I made the comment about shazamming only once a day because I’ve read that if you do it more than once a day, it invalidates all of your shazams for that song, that day. Like when fans got asked by Adam during Trespassing to stop over-requesting his songs because it invoked more negative than positive feelings from the radio stations. We only want success for Adam & all The Original High songs so this was more a message to fans who may not know the ins & outs of Shazam. Thanks, Carol for this last post. You have been so faithful in keeping us current on everything Adam. I was happy to hear what he’s learned from being on tour with Queen. He seems to be a sensible person, but having an opportunity to learn music life from one of the greatest bands is the ultimate teacher. Great job, Carol! I don’t quite understand why there is a feeling to tell Adam what he should or shouldn’t be… Pop or what ever. Seems some fans sometimes think they know best vs appreciating the art that is being created. I may have missed the intent of your comment about asking something that should be asked but fans won’t… Please help me understand the ( I’m sure meant to be from a good place, as Adam would often say it’s comes from) intent. Congrats on being part of a small and intimate group and to have that much time with Adam one on one. I can’t believe she asked him the question about Pop. And that you thought it was acceptable. She dissed Pop at a POP RADIO EVENT. I’m embarrassed for her, embarrassed for us fans that aren’t out of touch like that, and enjoy the kind of music that Adam is into and makes. If she (or anyone else) doesn’t like Pop, then why are they here? They should move on and let the rest of Adam’s fans have a sigh of relief at them finally being gone! She sounded drunk and completely unaware. If she wasn’t drunk, they she’s just unaware. I hope she never gets so close to him again. By the way, most fans DO NOT like when someone speaks for “us glamberts” so, stop it please. Thanks for sharing your story, but really, so much to be embarrassed about here. Thanks for sharing with us, CAROL, that was a great recap!!! WOW…that was a GREAT set up for you girls! Only a few fans and a HAPPY HOUR besides! Loved the interview too! I see other comments are showing up but mine is still in moderation. That’s because you cant take a little dose of truth. She was incredibly rude and you are just as bad for being supportive of her behavior. Nope, sorry to disappoint, but I just hadn’t gotten a chance to look through the comments in a couple of days. We did not know her before she sat with us, nor did we have any control of her question or what she said or did. We posted the video because it’s Adam and it happened and we thought fans would enjoy seeing the video regardless if we (or you) agree or not with what went down. Thank you for sharing your story and the video. I enjoyed reading about your experience. However, I am confused as to why you feel a fan informing Adam that he is not a pop singer is polite. To me, it was discourteous and condescending. Fans do not know better than he does about his musical direction. He has repeatedly expressed his love for pop music and his wish to be a pop artist. He wants to reach millions with his songs, not be the personal jukebox for a small group of “fans.” It was especially inappropriate in this venue, in front of radio and label personnel. I hope that fans who would prefer a genre other than pop can find a suitable artist to support and leave Adam to people who actually appreciate and enjoy his music. Oh, and that “classic Lambert time” comment? In my opinion, that’s condescending, too. Thank you for your time. I can’t wait to see the message directly from Adam! Thank you for filming it for us! Post it soon! I do have to admit I thought Robin was a little out of line saying those things to Adam about pop music, especially in front of the WB people and the radio station people. I am glad Adam cleared things up for her. He is a pop star. It was SO EXCITING! Even though I only drank seltzer water I felt like I had a buzz the rest of the day! After listening I agree that Robin was very Rude and an embarrassment to the Glamily. She was loud, over barring, insulting Adam, the radio station who graciously included her and the Brilliant writers of Adams new music. It blows my mind that Robin wasn’t asked to be quiet by the radio station management. I just hope this never gets to air on the radio because she embarrassed the Glamberts. Regardless of how anyone feels it’s NOT your place to tell Adam ANYTHING about how he should do ANYTHING! If you live Adam, you love him unconditionally and support what ever he does or leave him the hell alone. I hope everyone takes a lesson from this as how NOT TO ACT if ever given the opportunity to meet Adam or attend a m&g, or radio station. No one should ever speak from the ” Glamberts” at any time. This is getting ridiculous. Adam Lambert Leads by example on MANNERS CLASS & INTELECT, so take his lead ladies and have some CLASS! It’s a new Amazing era for Adam & how his fans represent themselves says everything.